The Taylor Precision 3505 6" candy thermometer is made of stainless steel and comes with an adjustable temperature indicator. It also has a 2" dial face and a dual scale reading. The temperature range of this thermometer is from 100 degrees Fahrenheit to 380 degrees Fahrenheit. This is the only negative review I have ever given, but I will say this thermometer seemed to take a long time to read the temperature and it was not as accurate as my other big candy thermometer that I bought this to replace. Thank you for your review, Valerie! We are sorry this Taylor 3505 TruTemp 6 inch Candy and Deep Fry Thermometer has not worked well for you. A Customer Solutions Representative will contact you soon! I love this thermometer, perfect for making candies. Easily clips to the pan, the numbers are easy to read on the dial and it seems accurate. The Taylor TruTemp 6" Candy and Deep Fry Thermometer is a great value item. It is inexpensive and is highly accurate. I would highly recommend this! This thermometer is convenient and easy to use. It's good quality and a great size for measuring the temp of various dishes in our restaurant. This is well worth the value. you really can't beat the price. If I was doing something where I need extremely precise measurements, this wouldn't be the tool. but for batch frying this product is PERFECT. This fry thermometer has helped us monitor the temperature of our frying oil to be accurate with our cooking. The hook on the side comes in handy and can be moved out the way to ensure it doesn't obstruct the cook. Sometimes the face of the thermometer can fog up, but it doesn't happen often. This product works great. I use it for Carmel and it's nice because it allows me to hook it to the pot. Great price as well. Works great! The gauge is just the right size to be able to see the temperature. Would definitely recommend and buy this item again. Great price! use it for making candy as well for my fryer at home its nice to have it all in one with along stem to keep away from hot foods easy to read as well. This thermometer works wonderful. I have been needing something that i could use when i make caramel and other candies and this worked extremely well. This thermometer is convenient and easy to use. It's good quality and a great size for measuring the temp of various dishes in our cafe. The thermometer works very nicely - so far its use has been oil temp for frying chicken. I like that it clips to the edge of the pan. I ordered this candy and deep fry thermometer a while ago but I didn't have chance to try it out to tonight. I'm glad I got it. This candy thermometer is accurate with three degrees. I love the fact that it is easy to use and has saved me from burning everything from fries to homemade caramel. Having just used this the other night to make some homemade chips, I can confidently say that this thermometer does its job. It securely and easily attaches to the side of your pot and clean up was a breeze. Easy to use and it seems to hold off on any moisture getting into the glass. A great buy. I haven't had to adjust the calibration and our sugar work is spot on. I'll be honest, I love deep fried desserts. From churros to doughnuts, empanadas to fried oreos. And while I don't indulge often, when I do I like to cook things properly. This thermometer is a great way to see exactly where your oil is at and get the most consistent results. This did not work for me at all. I tried calibrating it in hot water and it still did not work. It would never move beyond 110 degrees. Too late to return so I'll have to toss it. Thanks for reviewing this item! We are sorry to hear that the thermometer you received was defective. We suggest this Taylor Candy Thermometer as an alternative. Its stainless steel construction is durable and this item is dishwasher safe! Large, easy to read thermometer. Durable and well built, the price on this cannot be beat. Our local store was asking more than twice as much. Unbeatable price for stainless shaft and large, easy to read dial. We shopped around and couldn't find anyone who could match these for the price. Same Taylor quality that you will pay twice as much for locally. Used for making fudge, or for heating sugar to make homemade candy. Washes up easily, and comes with a 1 year warranty. 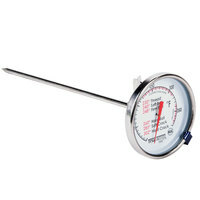 This thermometer is easy to use, it has a timeless design, it is accurate, sturdy and reliable. We are happy with it and it is an excellent price for a great product. So far It's worked for what I needed it to do, which isn't a lot to be honest. I've used it to make yoghurt and it did the job very well. The yoghurt came out better than usual because the temperature reading was very accurate. I'm sure If I use this for actual candy making it will perform wonderfully. I use this thermometer for making fudge, and requires me to use two hands, one to hold the pot and one to stir the sugar mixture. So with the clip on this thermometer, I am able to watch the temp while using my other hands. For the fudge though, I am getting a soft ball stage at about 232 degrees on this thermometer even though the face of the thermometer says 240 for soft ball. Maybe this is just a reflection of my ingredients. In any case, I just know where the reading should be every time I make fudge and seems to be very consistent. I would definitely buy this one again for my usage in making fudge. Used to check the grease temp when I fry Southern Fried chicken and don't want to overheat the oil. Great gadget especially for this price. Received this in 2 days. Thank you! The Taylor 3505 TruTemp Candy and Deep Fry Thermometer works perfect to make sure your candy is at the perfect temp. this item is priced right, and if you don't have one I sugest you order up a few. They are great to have. This product makes candy making a breeze! And with deep frying it certainly helps if you're very particular about correct temperatures for different products. Plus it has a price that can't be beat. This is the perfect thermometer for making candy apples. We make a lot of candy apples in the fall the customers love to get them to go. It can also be used for other candy's or for carmelizing sugar for certain recepie's. Takes an inordinately long time to read temperature - more than a minute to go from 0 to 250. Also has an incredibly short stalk, so the clip is useless unless you're using a short-sided pot or an unnecessary amount of liquid, both of which are dangerous. This thermometer is more heavy duty than others I have bought. Seems to be accurate and holding up well. This thermometer is worth the money. Apart from sugar syrups, I also use the candy thermometer for yogurt making and frothed milk for coffee. This one has a large dial, the markings are easy to read, it looks sturdy, and works well. This is the perfect thermometer for sugar work. Easy to cook sugar to the exact temperature needed for the item you want. Decent for deep frying too. This is a good TruTemp candy and deep fry thermometer!! Great for cooking with all sorts of oils! Nice clip on feature will work great for deep frying in woks!!! This thermometer seems to be very accurate, and you can't beat the price! The clip is very handy too for attaching it to my deep fryer. This is a good deep fryer thermometer. It's not expensive like some thermometers, but it does get the job done. I would say that mine is very accurate. This is a decent thermometer for on the stove deep frying. you can accurately heat your oil and not worry about burning anything or catching fire.